This entry was posted in Fibre and tagged Crochet, hexagons, kemps. Bookmark the permalink. Thanks Marianne! It’s amazing the difference a change in hook makes. I keep hoping that one day very soon the doctors will finally decide what is wrong with me and then I can get some treatment, at the moment it’s a mix of painkillers and not doing anything that upsets my body. I will go and investigate oils, I don’t enjoy the smell of lavender but I am sure there are others out there. I love these colours. 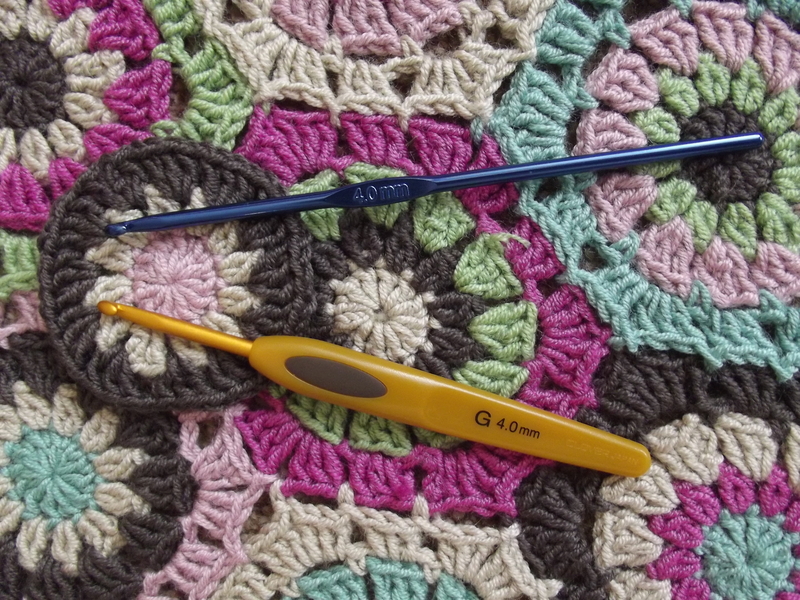 I have been trying to learn how to crochet for years as I am a knitter and a spinner. But it took moving to Egypt and lots of free time to learn it. I don’t know what I was afraid of!!! Although I still cannot hold the wool in my left hand. I still crochet like I am knitting!!!! But it works! I bought myself a sheep too so I could spin my own wool here but it is short and coarse and only good for weaving! But at least it is something. Trying to find non-Chinese yarn is a challenge too!!! The lengths yarn-lovers will go to to keep crafting!! I must be the mirror image of you – I always hold the wool in my left hand and people always look very confused when they watch me knit, I think I knit like I crochet so it is sort of continental-style. Oh how interesting!!! I am trying to imagine how you do that…My Danish step-mother used to knit like that. She tried to teach me once…but… Dyslexia rules. KO? Turns my head inside out!!! I gave up and just did what felt comfortable. I think we all end up doing that! I was taught to knit by nuns in the sixties so I think it is just ingrained!! Its hard to change ancient habits!!! Love your hexagons! Almost enough to make me give crotchet another try. I have an ANCIENT hexagon blanket that belonged to my grandmother that is made with some nameless acrylic and is tough as nails. Hmmnnn…maybe it’s time to take a look at my yarn stash and think about making a new blanket from something softer! And thanks for linking to the join-as-you-go constructions. I’d probably be homicidal if I had to sew all those hexagons together. P.S. I’m suffering from spinner’s ankle myself this morning so I totally get the need to find something else do for a while that doesn’t hurt. I have several blankets made by various elderly relatives that are indestructible, there must be something in the yarn that was available back then!! Hope your ankle recovers soon. 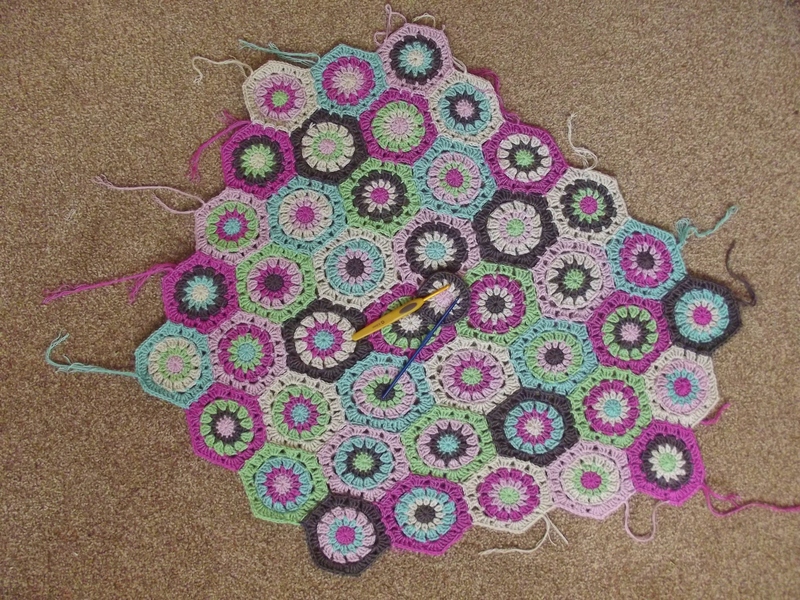 I just finished my hexagon afghan… I love your colors! As far as joints, I have terrible problems… I even had to figure out an alternative way to hold the yarn in my left hand while I crochet because my original way of holding the yarn in my little finger would render my finger paralyzed… It would be painful just to try and open it back up. But I started taking Glucosamine/Condroitin/MSM; a combination of all three that I get from Puritan’s Pride online. Stuff I got at the drug store didn’t work, but this brand does. It makes all the difference! I’ll have to try lavendar oil as well.